My tomato harvests have been ramping up now that the warm weather is here. On Sunday I harvested over 28 pounds of tomatoes. With this many tomatoes it’s time to start canning. The recipe I’m starting with is tomato soup. I made this last year it was by far our favorite canned item. We finished off all of the jars earlier this spring, so this year I need to can more than I did last year (31 pints). I’m particularly excited about this soup because this year I grew my own celery. I also started a lot of onions, but onions are one of those things that don’t do all that well in my garden, so I’ve been buying them at the farmer’s market. 8 quarts fresh tomatoes (or 5-6 quarts of juice) *I coarsely chop mine in quarters leaving the stems on them since I’m putting them through a food mill. 1. Chop onion & celery. Place in large kettle w/ just enough water to keep them from burning. While this simmers, cut tomatoes (remove stems if not using strainer). 2. Add tomatoes to kettle & cook until tender. 4. Return to kettle, add lemon juice, sugar & salt. 5. Cream butter and flour together& mix thoroughly with two cups of reserved juice (chill so it’s cold), until dissolved (or blend together in a blender), to avoid lumps of flour in the juice. Add butter/flour mixture to warmed tomato juice. (Add before it’s hot, to avoid lumps of flour!). Stir well. 6. Heat just until hot. (If it gets to a boil, it can make the flour lumpy). Just prior to boiling, turn off the burner. (It will continue to thicken as it cools.). 7. Ladle into hot jars with 1/4 headspace, close securely with lids. 8. Put in canner & process 30 minutes (start timing when it’s at a ‘rolling’ boil). 9. Remove from canner & allow to set until sealed (approx. 12 hours) To serve, mix equal parts tomato concentrate to milk, and add 1/2 t. of baking soda per pint as it cooks (1 t. per quart). I actually prefer to add chicken stock to mine instead of milk & baking soda. I serve with a sprinkle of freshly grated romano cheese, a sprinkle of cayenne and a little freshly ground black pepper. **Some people say this isn’t long enough in a canner, some people say you should only pressure can this recipe. I’m happy with it and am quite comfortable making it and processing it in this way. If you’re uncomfortable with this method use whatever canning method you’re comfortable with. What’s your favorite home-preserved garden food? I’m just starting to preserve, but I think so far I love my friend’s tomato soup and her peach jam. Toss up between the two – they are both very fresh and summery, and in the winter that is priceless. 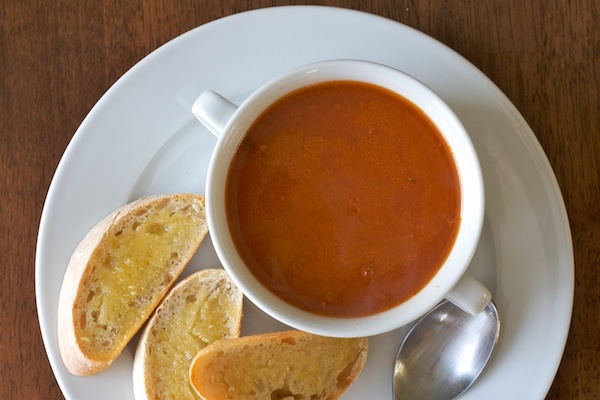 Somehow the tomato soup is especially welcome, as its warm and filling too, and can itself be a base for many other soup varieties and mix-ins. .-= Mangochild´s last blog ..The Impact of “Kitchen Gardening” =-. Salsa. Which I may not get to make this year. Stupid blight. .-= kristin´s last blog ..All Is Not Lost =-. I have been working hard to get more salsa on the shelf than last year, since we ran out way too early. Soup is a great idea. Last year I made some roasted tomato soup and froze leftovers. It was so comforting and summery to eat in the dead of winter–this post inspires me to make a BIG BIG batch and freeze a bunch of it. That’ll use up some more tomatoes, yay!. .-= s´s last blog ..overload =-. I just spent this past weekend canning with my best friend for an entire afternoon. She had just gone on a road trip, and stopped by several “pick your own”s on the way back. I think we canned 12 quarts of tomatoes, and the same number of pints of blueberry jam (she had actually picked nine gallons of blueberries!). So delicious. .-= Christine´s last blog ..So busy around here =-. 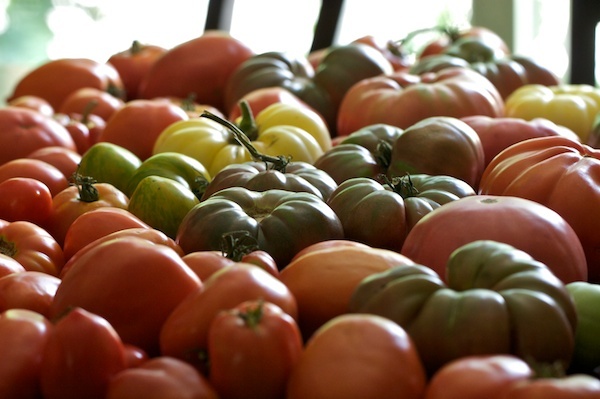 Wow – can I just say…I”m totally and completely jealous of your tomatoes. They look amazing!!!! Ours were pathetic this year….none of our seedlings made it, and then we were given plants by my MIL from the nursery she works at. Of course they’re now all infected either with blight or septoria (most likely). Luckily our CSA is more than making up for that! .-= Sherri´s last blog ..the winner is… =-. Now if I can just harvest the amount needed for this recipe…I’m makin’ soup!!! sounds delicious and those tomatoes are so beautiful. Aren’t high acid foods the ones that don’t have to be pressure cooked? .-= michelle´s last blog ..Sunflower Fields Forever =-. Yes, but some people say that since it has flour and butter in it that it should be pressure canned. So far this year it’s bread and butter pickles. But your soup looks pretty tempting! Thanks. .-= Lexa´s last blog ..The Farmer’s Market =-. I’ve been making all different kinds of pickles as well. Your recipe sounds intriguing…making a concentrate like supermarket canned soups. I’ve never seen anything like that before. If you were to follow the USDA’s recommendations to the letter of the law, you’re not supposed to can with ANY starch, dairy or fat, period (except maybe a tablespoon or so of oil for softening veggies in a soup). The only exception to the rule is “Clear Jel,” a modified corn starch that apparently can withstand the heat of canning. It’s used mostly in recipes for ready-made pie fillings and produces a clear thickened liquid like corn starch would. Both of those are pretty poor explanations, in my opinion. Nonetheless, I stay away from starch and too much oil in my canning. If I’m making a thickened soup, I often package it with a “thickener packet” (1 tablespoon of flour in a plastic bag) to be added before reheating. Seems to work very well. Honestly, I think the USDA is just paranoid and doesn’t want the responsibility of someone mucking with recipes on their watch. So, they go a bit overboard. I agree, I find it difficult to think that the USDA is looking out for my best interests when they see nothing wrong with genetically modified crops and crops sprayed with roundup and other chemicals. Yet they think I shouldn’t can tomato soup with some butter & flour in it. Yes, I understand that some people completely agree with the USDA standards – I do not and am perfectly comfortable using this recipe. Just like I’m perfectly comfortable drinking raw milk. I do not feel that all my food need to be boiled/processed to oblivion and I’m going to do my best to make all the processing (even home canning) as minimal as possible. You risks of getting sick from something you eat are far higher from eating restaurant salads and CAFO meats. 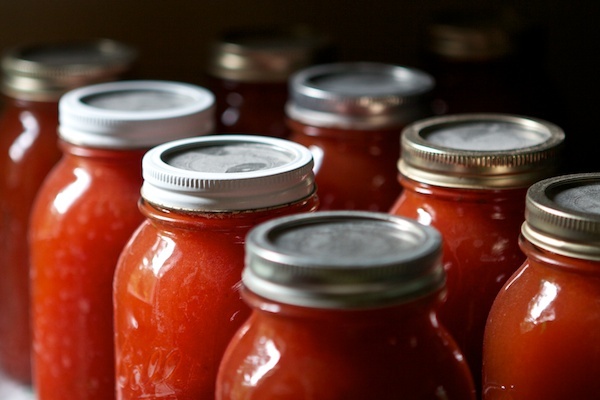 I’m just learning to can and preserve this summer & tomatoes are at the top of my list. I have a question about quantity. How many jars did you get from this recipe? .-= Ashley´s last blog ..Good Eats: Il Cane Rosso =-. I got 9 quarts from this recipe. The recipe itself states 8-10 quarts. Mine? Oh, jam. Lots of jam. Jam and more jam. I only wish I’d had a bumper crop of apricots this year. Maybe next year. .-= stefaneener´s last blog ..Maybe I should stop now =-. When you say 8 qts tomatoes, should I just be filling my 2 qt bowl with whole tomatoes 4 times? Is this about 1/2 a bushel? Do you mean chopped/peeled tomatoes? Help! .-= Amy F´s last blog ..To Peter, during your first week of kindergarten =-. I fill my 2 quart pyrex with chopped tomatoes. Since I’m putting mine through a food mill I chop them very roughly and don’t even remove the stems. I tried this recipe and it was so completely delicious. I halved it because I didn’t have enough tomatoes and it still turned out great. I even added a teaspoon of fresh coriander seeds since I didn’t have celery on hand. I was licking the bottom of that pan like Winnie the Pooh in a honeypot. Since I’m new at canning and I didn’t have all my ducks in a row at that point (aka. jars) I froze it. I just heat my soymilk, add my tomato cube and wait for the incredible feeling that comes from warm soup on a cold day. Thank you. I know, I made twice as much this year to can as I did last year. We should be able to eat it often! I like the Tomatoe Soup recipe but do not know why you add the baking soda. Also, can the recipe be done safely without the salt? I don’t add the baking soda because I warm it up and add chicken stock instead of milk. I believe you add the baking soda to keep the milk from curdling because of the acidity of the soup. I’d add a little salt since it does help with preservation, I find that I add the lower end of the salt called for in the recipe and less sugar as well. Thanks for stopping by, i think you’re going to LOVE the soup. I have an old Squeezo juice that my mom gave me. Generally canned goods will stay fresh for a year or so, as with other preserved items they don’t necessarily go bad, but they start losing taste. Usually we eat up all the soup within a year, this year we have 2-3 quarts left from last year’s batch, they’ll be gone soon. Usually with items like beans, soup, tomatoes, etc you can count on them being good for about a year or 18 months. Jams, jellies and chutneys will usually be OK for 2 years as I find for fruits canned in sugar syrup as well. I’m working on canning veggie spaghetti sauce right now and will be making your tomato soup tomorrow! It sounds great! Do you cook the tomato/celery/onion mixture to reduce it? I don’t see that step in your recipe and wasn’t sure how this ended up concentrated unless you cooked some of the water out of it. Also, is the two cups cold juice in addition to the 5 – 6 quarts or part of the 5 – 6 quarts? The two cups of juice are from the 5-6 quarts, I reserve it after putting through the squeezo. I cook the mixture for about 30 minutes until all the veggies are soft then put through the mill, it’s not necessarily a concentrated soup, you could probably eat as is canned without adding stock or milk, but I prefer mine with stock added so it’s not so strong. You do cook it for a while to heat & to add the butter & flour to thicken. I find that it’s usually quite concentrated enough without reducing. I’m sure part of it depends on what kinds of tomatoes you use as well. I usually use a mixture of romas and juicing tomatoes, if you used all romas it would be a stronger soup and if you used all juicing tomatoes it would be more watery or less strong. Thanks! I’m getting it started in just a few minutes, so these clarifications are greatly appreciated. I made a tiny bit more and got 10 quarts out of it! Yummy! Do you know how many pounds of tomatoes would be in a quart? I have 100 pounds sitting here, trying to parse out what is for what recipe. Thanks for the soup recipe! I made a double-batch last night, and next time I will reduce the flour and butter. It tastes a bit flour-y and I lost some great red color. I didn’t need much additional thickness even using all slicing tomatoes (Early Girl and Fantastic). Everything else is great about the soup. Thanks for the write-up. I like it thick and since I’m adding a quart of chicken stock or whey to each quart it really thins down. Glad I found your site. Thanks! Canning your own tomato soup is really very delicious because you are assured that you are eating fresh and safe tomato soup. Thank you so much for sharing the tomato soup recipe. I have had a bumper crop of Roma tomatoes, and it was fun putting up some tomato soup. Thanks for the delicious recipe! Canned a bunch last week and just had the first taste for lunch — yummy. It turned out a little thinner than I would like, so next time I would reduce a bit more. The beauty of recipes — you make it the first time as is and then adjust it to fit your family’s taste. Thanks again! I use a 1/2 head of cabbage to thicken tomato soup and sauce. I cook it down, separate from the celery and onions. It does NOT impart a cabbage taste when mixed with tomatoes. This avoids the flour/oil issue with canning. I add the pulp after putting it through the food mill separately. Gradually add the hot cabbage pulp to the soup, as you would flour and butter. With the lemon juice in this recipe, there should be enough acid to enable you to safely use a Hot Water Bath process. I have also used apples, both to impart sweetness and avoid the sugar and to thicken the soup. Great, so glad you liked it. It is a winner of a recipe! I have a ton of tomatoes right now…I made salsa this afternoon, but I’m seriously considering making this tonight when the kids go to bed. I’ll let you know, I love quick and easy heat and eat dinners…this would be so healthy too!! I pinned this a few months ago on Pinterest and it has gotten SEVERAL repins! A very popular post for sure. I’ll let you know how it turns out!! !